Sige Moms and their families are in for a treat as Breeze with ActivBleach and Surf 5-in-1 give away free Jollibee favorites in the Sige sa Mantsa, Sige sa Libre Meal promo. without worrying about stained clothes. There are many ways to easily get free Jollibee treats from Breeze. 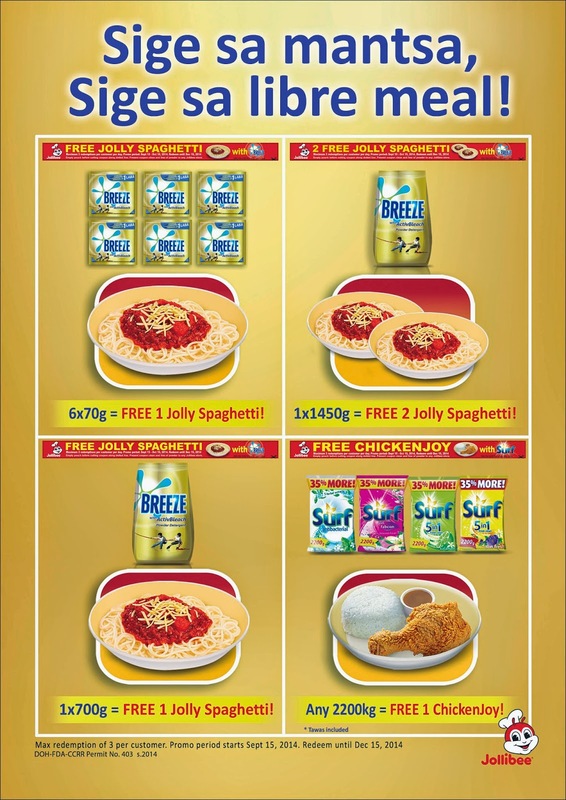 To get one order of Jolly Spaghetti, consumers must cut out and present the coupon at the back of a Breeze 700g pouch. Families can also enjoy two orders of Jolly Spaghetti for free, just by cutting out and presenting the promo coupon found at the back of a 1450g pack. Similarly, they can also take home one free Jollibee Chickenjoy with rice in exchange for a coupon found in the back of any Surf 5-in-1 2200g pack. Variants include Surf Tawas, Kalamansi, Antibacterial, Blossom Fresh and Sun Fresh. Consumers must make sure that their promo coupons are clean and free of powder, before they present these at any participating Jollibee store to redeem their favorite langhap-sarap treats. They can redeem up to three Jollibee items per visit per day. Boasting of a revolutionary formulation, it empowers mommies everywhere to take on their endless tasks, removing even the toughest of stains in just one wash. Safe for both white and colored clothes, Breeze has a four-enzyme technology that removes more types of stains and a patented whitening technology that delivers visible whiteness in just one wash. It is also the first and only detergent brand with melamine perfume encapsulation technology that blooms in wash and bursts in wear, making sure that clothes keep smelling clean and fresh even when worn. It even has a unique active system for better foam profile and quicker lather, plus percarbonate TAED bleach that takes out bleachable stains without harming the environment. Remove even the toughest of stains in just one wash and enjoy your Jollibee favorites in the Sige sa Mantsa, Sige sa Libre Meal promo. This special treat runs until October 15, 2014. Jollibee meals may be redeemed until December 15, 2014. Per DOH-FOA-CCRR Permit No. 403 Series of 2014. For the latest promos and updates, like the official Breeze Philippines Facebook page at www.facebook.com/BreezePhilippines.